The First Glory Awards (2017): A Mini-Album | Ámauteurish! It’s difficult to tell a complicated story, especially one that involves a lot of other individuals and a major formative institution. This will be an attempt to recount a series of occurrences, some of them subjective in nature. 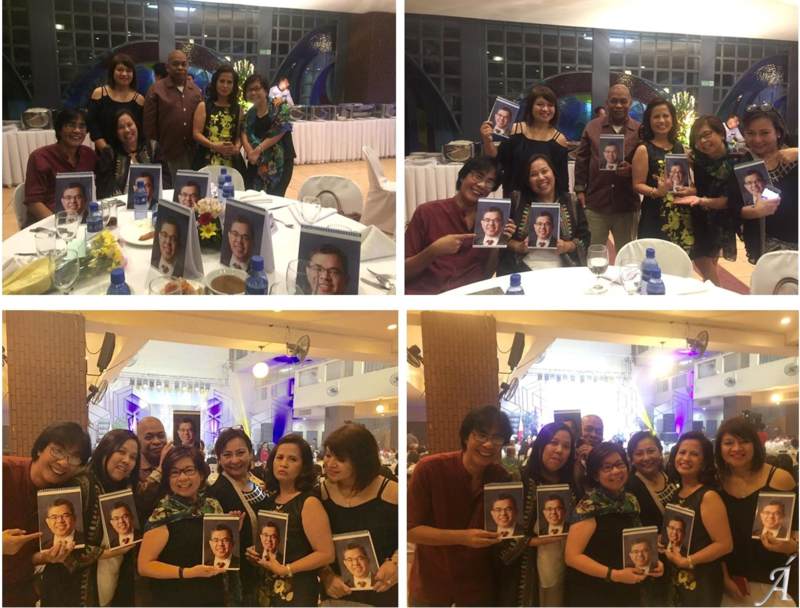 It began when the Alumni Association of my alma mater, the College of Mass Communication of the University of the Philippines, announced its own counterpart of the university-wide Alumni Awards. 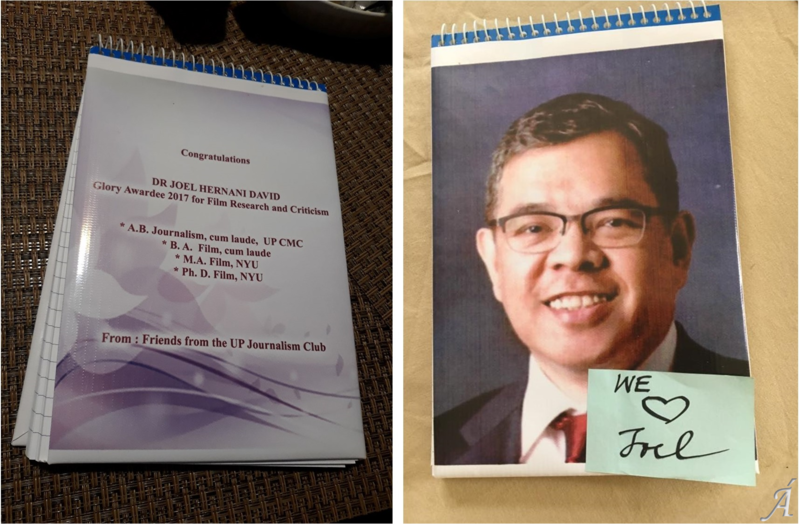 Since the event was sponsored by the family of the CMC’s founding Dean, Gloria David Feliciano (unrelated to me), it was going to be rather awkwardly named the Glory Awards. There were supposed to be ten selections for the first edition, and since I kept up with news about the college via social network, I caught the call for nominees the day it came out. When a former editor and journalism-school classmate of mine contacted me about it, I was inclined to say no. I’d already been feted at the previous year’s FACINE Film Festival in San Francisco, and to me that was a signal honor. Several senior film critics from the Philippines hold loads of distinctions from all over, but none of their life-achievement prizes specified film criticism and scholarship, until FACINE’s Gawad Lingap Sining [Art Nurturer Award] spelled it out for me. I even prepared an extensive lecture, the festival’s first in nearly a quarter-century since its founding, delivered at the City College of San Francisco’s auditorium (famed for its Diego Rivera mural). Three real-world factors blindsided me as I mentally conditioned myself for the awards ceremony. First, the faculty dormitory where I’d stayed since arriving about a decade ago for my tenure-track position announced that it was shutting down for renovation by the end of the year, and would be reopening as a university hotel. That meant I had to prepare to find my own housing for the first time in Korea, with all the concomitant complications that involved (starting with exorbitant down-payment fees). Then the results of my annual physical exam at the university hospital arrived, indicating that the gallbladder stone that I’d been, well, maintaining for a decade or so suddenly and inexplicably doubled in size, approaching what the doctor described as a “danger” threshold. My physician told me how fortunate I was that the condition remained benign through my sabbatical, since he knew the manifold troubles I would confront by requiring a surgical procedure in the Philippines. The surgeon assigned to foreign-language patients responded to my request for a laparoscopy by specifying the day right before the Glory Awards event. It was supposed to be an outpatient procedure, but I couldn’t imagine myself rushing from the hospital to the airport, wounds still fresh, and going onstage and hobnobbing with folks while checking for bloodstains on my shirt. So I requested, urgently, a week’s delay at the hospital – then the third “development” occurred: the organizers of an out-of-town Korean conference on Asian culture, to which I had made a long-standing commitment to participate, contacted me to say that it would happen … during the weekend after the Glory Awards, the same period I had planned to have my postponed operation. When I revised my request for another hospital date, I knew that the staff could have taken this as another of my endless shifts in schedules, and hesitated to respond to my request, considering all the difficulties (from additional tests to scheduling assistants) that this particular arrangement entailed. But this was not entirely the reason I felt inclined to postpone my roundtrip to Manila. As the day of the event approached, the reality that the institution I used to work with, from which I felt estranged, crept up and slowly, steadily engulfed me. The fact that Daisy Mandap considered my nomination and win her personal mission as a friend was key to this sentiment. A few years earlier, the college called for nominees for its ballyhooed Gawad Plaridel [Plaridel Award] for the category of community journalism. The last time I worked with Daisy (who’d gone to law school after journalism), at the now-defunct Business Day, she assisted in the collective-bargaining efforts of the employees’ union, continuing to represent them even after they decided to go on strike. As a new hiree, I could not qualify for union membership – and needed the income to repay my undergraduate student loans. Daisy told me it wouldn’t be an issue for her and her allies, which was all the assurance I could ask for. I wound up leaving anyway, because of an exploitative arrangement that a TV host had with the publication, cornering me as a personal researcher while plagiarizing my reports wholesale – including weird structural touches I would introduce to see if the program would still follow, and of course it did (the fact that the episodes I wrote won various local and global awards for the host was instrumental in developing my contempt for pretentious, privileged, hypocritical socialites). Business Day solved its union troubles by shuttering the newspaper and reopening it under a different-though-recognizable name, BusinessWorld, but Daisy found herself blacklisted by the publishers of major local dailies, including the very person who became the first winner of the Gawad Plaridel. She and her husband, Leo Deocadiz, left for Hong Kong, and set up The Sun, a publication with its own foundation aimed primarily at assisting Overseas Filipino Workers. I managed to convince her that we could argue for OFWs as a transient, foreign-based community, and she responded with plans of how to use the Gawad Plaridel prize money for the education of OFW members and their children. She of course became the frontrunner for that year’s award, but after the deadline for announcing the winner came and went, I knew (from a couple of decades of working in the college) that something unsavory was afoot. A few days later the evidence rolled out. All the nominees were declared undeserving, and a new category (in fact an old one), print journalism, was announced, immediately after which a winner – a friend of mine and, more significantly, of the college officials – was declared. I would not begrudge anyone a prize that she or he deserved, but I also believe that those who’ve had their share of recognition don’t need to be grasping for more. The officials happened to belong to an award-giving organization masquerading as a film critics group, and the Plaridel roster wound up affirming the same set of winners that the supposedly separate group (whose chair that year was also dean of the college) had selected. Something like saying that my mother’s choices are excellent because my father opts for them too, although it’s best if you don’t realize that they’re married. This was the reason why the acceptance speech that the Glory Awards organizers asked me to draft kept detouring into a rejection announcement. In the end, with my surgery schedule still unresolved, my exchanges with the awards team approaching conflict territory, and my admissions of dismay worrying my closest friends, I decided to cancel the trip and pay the penalty fee that the airline warned me it would charge. The ceremony went well, from all appearances, and I was deeply moved by friends’ expressions of support. I may be able to admit that I might have been glad to attend, but I’m even surer that, with my killjoy mind-set, the people at the event were much better off without me. I only note here what I told some social-media friends: that unlike Daisy and many others, I’ve been too good at bridge-burning, and a day for reckoning with all that will surely come my way in future. The college, to begin with, is and is not its alumni association, although to my mind, several people now considered senior faculty deserve as harsh a treatment as history will be able to bestow on them – with Daisy’s Gawad Plaridel case just one in a long list of depredations. Philippine Star announcement (above, left; photo by Jun R. Cortez); Pelikulove greeting (above, right; courtesy of Ellen Ongkeko-Marfil). Personalized notebooks from Ruby Villavicencio Paurom. Present Glory Awardees (above, left; photo by Joy Buensalido); absent Glory Awardee’s friends (above, right), comprising, left to right, Leo Deocadiz, Daisy Mandap, Ruby Villavicencio Paurom (photo owner), and Bayani Santos Jr.
Lower set of pics above, left to right: Martin Posadas Marfil, Ellen Ongkeko-Marfil, Bayani Santos Jr., Marianne Dayrit Sison, Ruby Villavicencio Paurom, Daisy Catherine Mandap, & Reggie Madriaga Capuno (all photos by Tita C. Valderama). 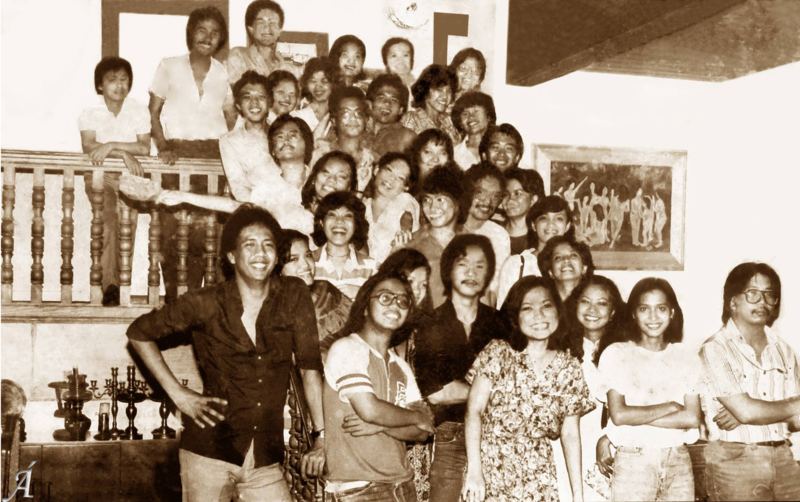 University of the Philippines Journalism Club circa late 1970s (from the collection of Martin Posadas Marfil). Video prepared by Alex Arellano; soundtrack by Noisy Neighbors Inc.; narrated by JB Tapia. This entry was posted on Thursday, November 23rd, 2017 at 10:59 pm	and tagged with Profession and posted in Politics. You can follow any responses to this entry through the RSS 2.0 feed.